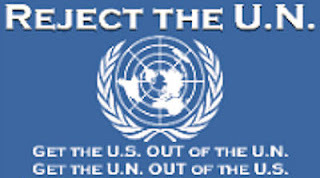 President Trump thanks U.N. Ambassador Nikki Haley. by Fred Lucas: The Trump presidency has been full of surprises, but personnel changes typically are telegraphed or leaked well in advance. Nikki Haley’s announcement of her resignation as U.S. ambassador to the United Nations, however, was a genuine surprise. Countries might not like what we do, but they respect what we do. Now if we say we’re going to do something, we follow through … whether it’s the chemical weapons in Syria, whether it’s with NATO and other countries have to pay their share, whether it’s the trade deals, which has been amazing. They get that the president means business, and we follow through with that.Trump chaired the U.N. Security Council for the first time this year during Haley’s stint as ambassador. 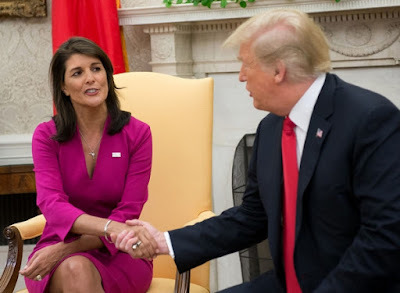 Tags: Fred Lucas, The Daily Signal, 4 Questions, Nikki Haley, Departure as UN Ambassador To share or post to your site, click on "Post Link". Please mention / link to the ARRA News Service and "Like" Facebook Page - Thanks!